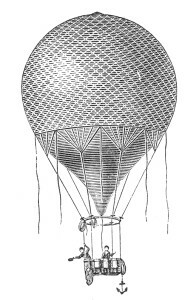 At 6 p.m. on the evening of July 4, 1888, a balloon rose from the Boston Common and drifted eastward over the harbor where it unexpectedly came down in the water not far from an area of land known as Point Shirley, which is located in the neighboring town of Winthrop. A strong wind was blowing, and the occupants of the balloon were dragged for three miles through the choppy waters until rescued by the crew of a steam powered yacht identified as the Rose G.
The names of the balloon’s occupants weren’t given. Filed Under: Massachusetts - Civil Tagged With: Boston balloon Accident, Boston balloon Ascension, Boston Balloon History, Boston Common Balloon Ascension, Boston Harbor History, Boston Harbor Rescue, Boston July 4th Celebration, Yacht Rose G.